Some students from SMP Budi Satrya look enthusiastic when cooking healthy vegetables by using stoves whose energy comes from bio-gas. Bio-gas at the Eco-farming Center has been around since 2014 with a capacity of 6-8 cows. However, currently Eco-farming Center has only two cows, has not been able to meet the capacity that should be. This program actually makes students to be able to process healthy food and drink from organic ingredients and vegetables. Before cooking, participants will be invited to prepare the ingredients to be cooked, including by harvesting vegetables or plants to be used directly, such as kale, ginger, lemongrass, yam, and others. One of the students was amazed to hear that the stove he used came from cattle dung. He does not believe livestock manure can be processed into an environmentally friendly fuel, as he used it when cooking. With a capacity of bio-gas that is not so much, but able to cook a vegetable until cooked. The existence of cattle in Eco-farming Center in addition to bio-gas, also made as manure for organic crops in the garden. This is what makes the need for cattle dung at the Eco-farming Center is still very necessary. 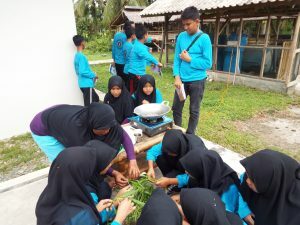 “Hopefully, the supply of cattle dung in Eco-farming Center can be maximized so that the bio-gas can run optimally so it will be more useful for the activities in Eco-farming Center”, said Khairuddin, Manager of PPLH Bohorok.